My boys are fans of the telly when it’s something that catches their eye and keeps their attention. Olive the Ostrich on Nick Jnr is one of them. 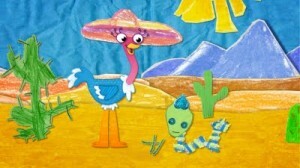 Olive the Ostrich is colourful, vibrant and entertaining. The narrator voice is that of Rolf Harris and it takes me back to my own childhood, when he used to do children’s shows even then. One of the things that stands out about Olive the Ostrich is that the backgrounds aren’t computer generated, aren’t perfectly designed, in fact they were drawn by children aged between 6 and 9 years old. How cool is that? They also designed some of the props and characters Olive interacts with. A few lucky schools got to attend some workshops on animation in order to create the backgrounds, etc. I know lots of children would love to do this, I think that is a great idea. Olive buries her head in the sand and her neck stretches, taking her on wild and imaginative adventures. She has a kind heart, does Olive and a huge imagination. Each episode brings a new adventure and a new problem for Olive and your children to help solve. The show is has so many beautiful colours, its hard not to sit and watch it yourself. I know my two are big fans and watch it while eating breakfast, before getting dressed for school, etc. I would recommend anyone with a pre-school age child, toddler or even newly school aged child to check out this show. It’s fun, bright and looks like children would create it because they did. 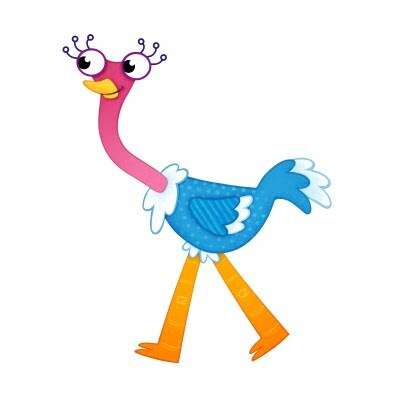 You can find out more information on Olive the Ostrich on the Nick Jnr website and it airs each weekday morning at 8:15am. If you miss it don’t worry as it’s repeated throughout the day. Disclaimer:- I was sent a few episodes on a DVD to review in exchange for an honest review.